Background: Acute subdural hematoma (ASDH) is mostly seen after head injury and is a major cause of morbidity and mortality. We studied the risk factors for ASDH and the effects of these factors on mortality as well as on survival with 100 cases from the rural area of Anatolia region. Materials and Methods: One-hundred cases of the ASDH that had been treated surgically between 2011 and 2014, at three different health-care centers from the rural area of Anatolia region, were retrospectively reviewed. Demographic data of patients, etiology, Glasgow Coma Scale (GCS) on admission, survival, presence of comorbid disease, unilaterality or bilaterality of the hematoma, and length of stay in the Intensive Care Unit (ICU) and/or neurosurgery clinic were recorded from the patients' files. Results: The total mortality rate was 34%. Age, etiology, GCS on admission, and laterality of the hematoma (unilateral or bilateral) affected the mortality rates (P = 0.005, P = 0.001, P = 0.001, and P = 0.001, respectively). Advanced age, low GCS on admission, and bilaterality of the hematoma were related with high mortality rates (P = 0.005, P = 0.001, and P = 0.001, respectively). The presence of comorbid disease and gender had no effect on patient survival (P = 0.299 and P = 0.861). Conclusion: The most important factors affecting the mortality rate were GCS on admission, etiology, age, and laterality of the hematoma in this study. Advanced age, low GCS on admission, and bilaterality of the hematoma were related with high mortality rates. Etiology had an important role in mortality rates, especially in the pedestrian injury group. However, there is no new study indicating mortality rates of ASDH patients. Various factors as age, Glasgow Coma Scale (GCS), computed tomography findings, and papillary reaction affects this high mortality rate were reported in different studies.,,,, To determine these risk factors are very important in terms of developing preventative measures. Low GCS on admission, advanced age, etiology, time interval between the trauma and operation, and abnormality in pupil reaction were related with high mortality rates. We aimed to reevaluate the mortality rates and risk factors of ASDH whether they changed or not and to check the last status of the rural area of Anatolian region for the last 6 years in 100 operated cases. This retrospective study included 100 consecutive patients with Caucasian origin ranging 18–88 years who had been treated surgically for ASDH in three different hospitals from rural area of Anatolia region; Yüzüncü Yıl University Faculty of Medicine, Bitlis State Hospital, and Bozok University Faculty of Medicine, between 2011 and 2014. Patients who underwent surgery in the first 4 h of trauma were included in the study. Cases that were managed conservatively, and those with missing file information, penetrating trauma, and nontraumatic ASDH were excluded from the study. Patients with multiple organ traumas were also excluded from the study. The data about gender, age, presence of comorbidity (hypertension, diabetes mellitus, coronary heart disease, and chronic obstructive lung disease), laterality of the hematoma, GCS score on admission, and the interval between admission and operation time were determined from the files of the emergency service. Other data such as hospitalization period and mortality were collected from the files of the Intensive Care Unit (ICU) and neurosurgery clinics. Cost calculation was determined from the financial unit of the hospital. 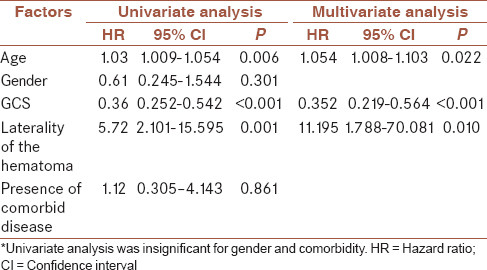 The age and gender of the patients, etiology, presence of any comorbid disease, GCS on admission, length of stay in the ICU and/or the neurosurgery clinic, survival, and laterality of the hematoma (unilateral or bilateral) by computed tomography were noted. Survival was evaluated as exitus or alive. The study protocol was approved with a number 24.02.2014-22 by the Bozok University Research Ethics Committee. Good clinical practice form, World Medical Association Declaration of Helsinki, Informed Consent from survivors and from primary relatives of dead patients, and medical confidentiality forms were filled. Quantitative variables are expressed as the mean ± standard deviation (SD) or median with interquartile range and were analyzed by Student's t-test, one-way ANOVA, the test as appropriate. Qualitative variables are expressed as numbers and percentages and were assessed by the Chi-squared test. Univariate and multivariate logistic regression analyses were performed to determine the associations of GCS and other risk factors with the mortality rate. Multivariate model for mortality, stepwise backward elimination was performed for factors with significant effects. Statistical analyses were performed with SPSS 15.0 (SPSS Inc., Chicago, IL, USA). In all analyses, P < 0.05 was taken to indicate statistical significance. Seventy-four (74%) male and 26 female (26%) patients were included in the study. The mean age was 42.2 years (range 18–88 years). The demographic and clinic data for patients with ASDH according to mortality are summarized in [Table 1]. The total mortality rate was 34% (n = 34); 23 (67.6%) were male and 11 (32.4%) were female. Older age has a higher mortality rate (P = 0.005). There was no significant relationship between the gender and mortality rate (P = 0.299). The mean ± SD GCS score on admission was 8.01 ± 3.12 (range 3–15). Patients were divided into three groups according to their GCS scores on admission as in the previous studies:, GCS = 3–8 (Group I, n = 60), GCS = 9–12 (Group II, n = 31), and GCS ≥13 (Group III, n = 9) [Table 1]. Survival rate was significantly associated with GCS score on admission (P = 0.001) Mortality rates were 55%, 3.2%, and 0% in Group I, II, and III, respectively. The other factor affecting mortality was the laterality of the hematoma. The mortality rate was higher in the group with bilateral hematoma (P = 0.001). However, neither gender nor the presence of comorbid disease affected the mortality rates (P = 0.299 and P = 0.861). Eleven patients had a comorbid disease (diabetes mellitus, hypertension, chronic obstructive lung disease, and heart failure), six of whom were male and five were female. The presence of comorbid disease was significantly related to age, laterality of hematoma, and length of stay in the ICU and neurosurgery clinic (P < 0.01). Etiological factors were divided into five groups; falling from a height (n = 25), vehicle traffic accident (n = 30), pedestrian injury (n = 30), assault by another person (n = 13), and other causes (attacked by a wild pig and struck on the head by a brick during a construction work) (n = 2). Demonstrating the relationship between etiology and survival with ASDH is summarized in [Table 2]. There was a statistically significant relation between etiology and mortality (P < 0.001). Patients in the pedestrian injury group had the highest rate of mortality compared with the other groups (P < 0.01). In our multivariate model for mortality, stepwise backward elimination identified three factors with significant effects [Table 3]. These were age (P = 0.022), GCS (P ≤ 0.001), laterality of the hematoma (P = 0.010). Statistically significant relationships were observed between length of stay in the neurosurgery clinic and the presence of comorbid disease, laterality of the hematoma, and length of stay in the ICU (P < 0.001; P < 0.05, and P < 0.001, respectively). However, there were no statistically significant relationships between length of stay in the neurosurgery clinic and etiology, age, and GCS on admission (P > 0.05). Length of stay in the ICU was significantly related to the presence of comorbid disease, laterality of the hematoma, age, and length of stay in the neurosurgery clinic (P < 0.01). The results of the present study indicated a total mortality rate of 34% for ASDH. The most important factors affecting the mortality rate were GCS on admission, etiology, age, and laterality of the hematoma. Song et al. reported a mortality rate of 39.2% in their study published in 2014. The mortality rate in our cohort was 34%, which was lower than the rates reported previously. Mortality rates in the presenting study were 54%, 3.2%, and 0% in Group I, II, and III, according to GCS, respectively. Kaptanoglu et al. reported their mortality rates as 88.5%, 50%, and 7.7% in similar groups in a study published in 2001. Karasu et al. reported their mortality rates as 70.2%, 54%, and 23.8% in similar groups in 2010. According to the results of the above-mentioned studies, our mortality rates are lower in total mortality rate and in subgroups. The better outcomes obtained in this study may probably related to the operation in 4 h following ASDH. Time of surgery is another controversial issue in the management of ASDH. Some authors reported that an operation performed in the first 4 h after trauma increased the functional recovery rate and decreased the mortality rate.,, However, others reported no significant difference between cases who underwent surgery in the first 4 h and those who did so later., Authors supporting early surgery proposed that blood and blood breakdown products have toxic effects on the brain cortex under the hematoma, and the hematoma causes disruption of brain functions and thereby leads to decreased blood flow. Moreover, increased intracranial pressure adversely affects blood flow in the brain. Therefore, these authors advocate early surgery. All of the patients in the present study underwent surgery within the first 4 h after onset with a low mortality rate. In the light of these, we suggest early surgery for ASDH. Some positive and negative prognostic factors have been identified, but studies in the literature reported conflicting results regarding these prognostic factors. Age was considered a significant prognostic factor in some studies.,,, Wilberger et al. compared patients with ASDH older than 65 years of age and younger than 34 years old and concluded that mortality and functional recovery index were significantly different between the two groups. However, in other studies, age did not have a significant effect on mortality.,, In the present study, we did not divide patients into subgroups, but our results suggested that age has an important effect on mortality. We evaluated the effects of laterality (unilateral or bilateral) of the hematoma on mortality. Our results indicated a significant relationship between laterality of the hematoma and mortality. This relationship may be related to the above-mentioned effects of the blood and blood breakdown products.,,,, Moreover, the laterality of the hematoma was significantly associated with age and length of stay in the ICU and/or neurosurgery clinic. Differing from previous reports, we evaluated the length of stay in the ICU and neurosurgery clinic; the mean lengths of stay in the ICU and neurosurgery clinic were 11.8 days (total 1180 days) and 8.3 days (total 830 days), respectively. Factors affecting the durations of hospitalization were age and presence of comorbid diseases. 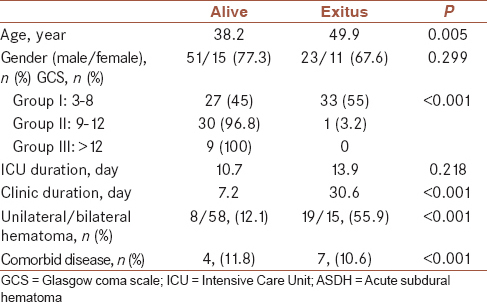 The lengths of stay in the ICU and/or neurosurgery clinic were significantly different. The total cost of hospitalization per ASDH patient was about US$4000 in Turkey, not including surgery, anesthesia, and additional medical devices such as high-speed motor devices, hemostatic materials, and artificial dura. With those included, the total cost was even higher, indicating that ASDH is an expensive pathology. The etiological factors identified in this study suggest that ASDH could have been avoided by minor preventive measures in all but a few of our patients. Our results clearly showed that some factors (getting old, etiology of the trauma, low GCS score on admission, and bilaterality of the hematoma) badly affected the prognosis of patients. Moreover, presence of comorbidity affected the hospitalization time of patients. As we know, traumatic subdural hemorrhage may be avoided by simple preventive procedures such as increasing traffic rules, especially for pedestrians and increasing preventive for falling from heights. With the simple preventive measures, the frequency of ASH may be decreased. In addition, the management of patients having risk factors mentioned in our article with more attentive approach may decrease the mortality and costs. Limitations of this study are the retrospective nature of the study, unequal distribution (number of patients in each subgroup) of subgroups, and not counting total cost including surgery, anesthesia, and additional medical devices, such as high-speed motor devices, hemostatic materials, and artificial dura. Furthermore, we did not mention about the presence of radiological findings such as midline shift and some physical examination findings such as presence of anisocoria due to the some missing information on patients' files. The mortality rate of ASDH has been decreasing over time. GCS on admission was the most important factor affecting the mortality rate. Low GCS on admission resulted in poor survival rates. Unilateral hematoma resulted in higher mortality rates compared to bilateral hematoma. In addition, getting old was related with decreased survival rates. However, the presence of comorbid diseases increased the duration of hospitalization but did not affect mortality. Servadei F. Prognostic factors in severely head injured adult patients with acute subdural haematoma's. Acta Neurochir (Wien) 1997;139:279-85. Ghadrjani S, Hadi MR. Rapid spontaneous resolution of acute cranial subdural hematomas – Two case reports. J Res Med Sci 2013;1:116-9. [Special Issue: Proceeding of Iranian Neurosurgery Congress]. Karasu A, Civelek E, Aras Y, Sabanci PA, Cansever T, Yanar H, et al. Analyses of clinical prognostic factors in operated traumatic acute subdural hematomas. Ulus Travma Acil Cerrahi Derg 2010;16:233-6. Song C, Ren X, Zhao B, Fu H, Lin S, Zhang Y. Analysis of prognostic factors for patients with traumatic acute subdural hematomas treated by surgery. Zhonghua Yi Xue Za Zhi 2014;94:1349-52. Kaptanoglu E, Solaroglu I, Uçar MD, Okutan MO, Beskonakli E, Taskin Y. Acute subdural hematomas: Surgical treatment. Retrospective analysis of 73 cases. Ulus Travma Derg 2001;7:246-9. Wilberger JE Jr., Harris M, Diamond DL. Acute subdural hematoma: Morbidity, mortality, and operative timing. J Neurosurg 1991;74:212-8. Kiboi JG, Kitunguu P, Angwenyi P, Sagina L. Outcome after acute traumatic subdural haematoma in Kenya; A single center experience. Afr J Neurol Sci 2010;29:38-42. Available from: http:// www.ajns.paans.org/article.php3?id_article=333. Feliciano CE, De Jesús O. Conservative management outcomes of traumatic acute subdural hematomas. P R Health Sci J 2008;27:220-3. Jamieson KG, Yelland JD. Surgically treated traumatic subdural hematomas. J Neurosurg 1972;37:137-49. Seelig JM, Becker DP, Miller JD, Greenberg RP, Ward JD, Choi SC. Traumatic acute subdural hematoma: Major mortality reduction in comatose patients treated within four hours. N Engl J Med 1981;304:1511-8. Becker DP, Miller JD, Ward JD, Greenberg RP, Young HF, Sakalas R. The outcome from severe head injury with early diagnosis and intensive management. J Neurosurg 1977;47:491-502. Stone JL, Rifai MH, Sugar O, Lang RG, Oldershaw JB, Moody RA. Subdural hematomas. I. Acute subdural hematoma: Progress in definition, clinical pathology, and therapy. Surg Neurol 1983;19:216-31. Miller JD, Bullock R, Graham DI, Chen MH, Teasdale GM. Ischemic brain damage in a model of acute subdural hematoma. Neurosurgery 1990;27:433-9. Walcott BP, Khanna A, Kwon CS, Phillips HW, Nahed BV, Coumans JV. Time interval to surgery and outcomes following the surgical treatment of acute traumatic subdural hematoma. J Clin Neurosci 2014;21:2107-11. Hanif S, Abodunde O, Ali Z, Pidgeon C. Age related outcome in acute subdural haematoma following traumatic head injury. Ir Med J 2009;102:255-7. Massaro F, Lanotte M, Faccani G, Triolo C. One hundred and twenty-seven cases of acute subdural haematoma operated on. Correlation between CT scan findings and outcome. Acta Neurochir (Wien) 1996;138:185-91. Haselsberger K, Pucher R, Auer LM. Prognosis after acute subdural or epidural haemorrhage. Acta Neurochir (Wien) 1988;90:111-6. Phuenpathom N, Choomuang M, Ratanalert S. Outcome and outcome prediction in acute subdural hematoma. Surg Neurol 1993;40:22-5. Bajsarowicz P, Prakash I, Lamoureux J, Saluja RS, Feyz M, Maleki M, et al. Nonsurgical acute traumatic subdural hematoma: What is the risk? J Neurosurg 2015;123:1176-83.